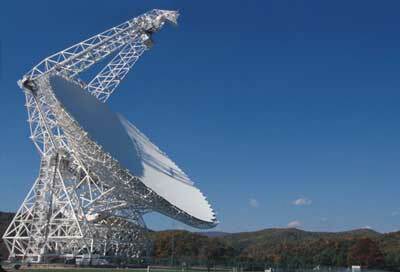 NRAO Radio Telescopes - Universe Galaxies And Stars Section. Radio Telescopes Will Contribute to Huygens' Mission. Radio Telescopes from the National radio astronomy Observatory. When Huygens makes its plunge into Titan's thick atmosphere on January 14, 2005, it'll be watched by a host of instruments, including the radio Telescopes from the National radio astronomy Observatory (NRAO). By measuring the frequency of Huygens' radio signals, scientists will be able to calculate the east-west wind speeds, and build a better model of Titan's weather systems. Another team will track the probe's trajectory to within 1 km (3,300 feet). When the European Space Agency's Huygens spacecraft makes its plunge into the atmosphere of Saturn's Moon Titan on January 14, radio Telescopes of the National Science Foundation's National radio astronomy Observatory (NRAO) will help international teams of scientists extract the maximum possible amount of irreplaceable information from an experiment unique in human history. Huygens is the 700-pound probe that has accompanied the larger Cassini spacecraft on a mission to thoroughly explore Saturn, its rings and its numerous moons. The Robert C. Byrd Green Bank telescope (GBT) in West Virginia and eight of the ten Telescopes of the continent-wide Very Long Baseline Array (VLBA), located at Pie Town and Los Alamos, NM, Fort Davis, TX, North Liberty, IA, Kitt Peak, AZ, Brewster, WA, Owens Valley, CA, and Mauna Kea, HI, will directly receive the faint signal from Huygens during its descent. Along with other radio Telescopes in Australia, Japan, and China, the NRAO facilities will add significantly to the information about Titan and its atmosphere that will be gained from the Huygens mission. A European-led team will use the radio Telescopes to make extremely precise measurements of the probe's position during its descent, while a U.S.-led team will concentrate on gathering measurements of the probe's descent speed and the direction of its motion. The radio-telescope measurements will provide data vital to gaining a full understanding of the winds that Huygens encounters in Titan's atmosphere. Currently, scientists know little about Titan's winds. Data from the Voyager I spacecraft's 1980 flyby indicated that east-west winds may reach 225 mph or more. North-south winds and possible vertical winds, while probably much weaker, may still be significant. There are competing theoretical models of Titan's winds, and the overall picture is best summarized as poorly understood. Predictions of where the Huygens probe will land range from nearly 250 miles east to nearly 125 miles west of the point where its parachute first deploys, depending on which wind model is used. What actually happens to the probe as it makes its parachute descent through Titan's atmosphere will give scientists their best-ever opportunity to learn about Titan's winds. During its descent, Huygens will transmit data from its onboard sensors to Cassini, the "mother ship" that brought it to Titan. Cassini will then relay the data back to Earth. However, the large radio Telescopes will be able to receive the faint (10-watt) signal from Huygens directly, even at a distance of nearly 750 million miles. This will not be done to duplicate the data collection, but to generate new data about Huygens' position and motions through direct measurement. Measurements of the Doppler shift in the frequency of Huygens' radio signal made from the Cassini spacecraft, in an experiment led by Mike Bird of the University of Bonn, will largely give information about the speed of Titan's east-west winds. A team led by scientists at NASA's Jet Propulsion Laboratory in Pasadena, CA, will measure the Doppler shift in the probe's signal relative to Earth. These additional Doppler measurements from the Earth-based radio Telescopes will provide important data needed to learn about the north-south winds. "Adding the ground-based Telescopes to the experiment will not only help confirm the data we get from the Cassini orbiter but also will allow us to get a much more complete picture of the winds on Titan," said William Folkner, a JPL scientist. Another team, led by scientists from the Joint Institute for Very Long Baseline Interferometry in Europe (JIVE), in Dwingeloo, The Netherlands, will use a world-wide network of radio telescopes, including the NRAO telescopes, to track the probe's trajectory with unprecedented accuracy. They expect to measure the probe's position within two-thirds of a mile (1 kilometer) at a distance of nearly 750 million miles. "That's like being able to sit in your back yard and watch the ball in a ping-pong game being played on the Moon," said Leonid Gurvits of JIVE. Both the JPL and JIVE teams will record the data collected by the radio Telescopes and process it later. In the case of the Doppler measurements, some real-time information may be available, depending on the strength of the signal, but the scientists on this team also plan to do their detailed analysis on recorded data. The JPL team is utilizing special instrumentation from the Deep Space Network called Radio Science Receivers. One will be loaned to the GBT and another to the Parkes radio observatory. "This is the same instrument that allowed us to support the challenging communications during the landing of the Spirit and Opportunity Mars rovers as well as the Cassini Saturn orbit Insertion when the received radio signal was very weak," said Sami Asmar, the JPL scientist responsible for the data recording. When the Galileo spacecraft's probe entered Jupiter's atmosphere in 1995, a JPL team used the NSF's Very Large Array (VLA) radio telescope in New Mexico to directly track the probe's signal. Adding the data from the VLA to that experiment dramatically improved the accuracy of the wind-speed measurements. "The Galileo probe gave us a surprise. Contrary to some predictions, we learned that Jupiter's winds got stronger as we went deeper into its atmosphere. That tells us that those deeper winds are not driven entirely by sunlight, but also by heat coming up from the planet's core. If we get lucky at Titan, we'll get surprises there, too," said Robert Preston, another JPL scientist. The Huygens probe is a spacecraft built by the European Space Agency (ESA). In addition to the NRAO telescopes, the JPL Doppler Wind Experiment will use the Australia telescope National Facility and other radio Telescopes in Parkes, Mopra, and Ceduna, Australia; Hobart, Tasmania; Urumqi and Shanghai, China; and Kashima, Japan. The positional measurements are a project led by JIVE and involving ESA, the Netherlands Foundation for Research in Astronomy, the University of Bonn, Helsinki University of Technology, JPL, the Australia telescope National Facility, the National Astronomical Observatories of China, the Shanghai Astronomical Observatory, and the National Institute for Communication Technologies in Kashima, Japan. The Joint Institute for VLBI in Europe is funded by the national research councils, national facilities and institutes of The Netherlands (NWO and ASTRON), the United Kingdom (PPARC), Italy (CNR), Sweden (Onsala Space Observatory, National Facility), Spain (IGN) and Germany (MPIfR). The European VLBI Network is a joint facility of European, Chinese, South African and other radio astronomy institutes funded by their national research councils. The Australia telescope is funded by the Commonwealth of Australia for operation as a National Facility managed by CSIRO.